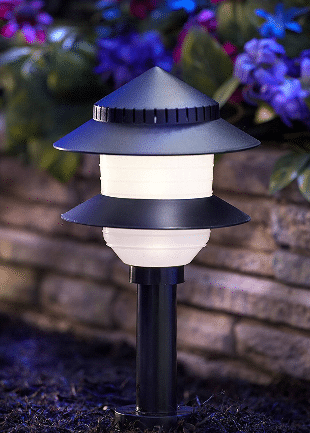 When looking to light up your pathway after dark, the Moonrays 95534 Low Voltage Landscape Light Fixtures may be what you need. This set will include all you need to light up a 50 foot run with 10 lights. I have 8 very similar lights in the front of my home, they span about 50 feet. The light they give out is enough to get in the house after dark and see where you are going. 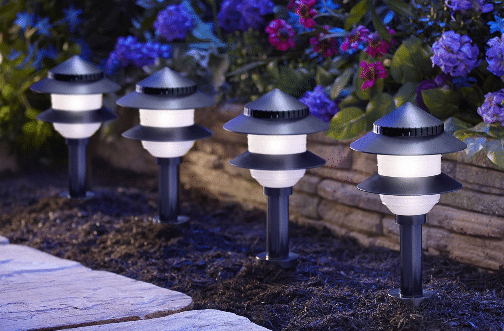 They will not light up the outdoors like daylight, they will provide enough light to provide safety and security for your outdoor space. Now lets look at the details and what it will take to get them installed and working correctly. 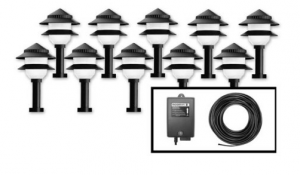 In this low voltage landscape lights kit you will get 10 light fixtures with 4 watt bulbs that have to be assembled, 50 feet of 18 gauge power cable, a 48 watt transformer with light sensor, for dusk to dawn control and 10 wire connectors. Every thing that you would need to have a 50 foot wire run with 10 lights, nothing else to purchase. The light fixtures are made of a black durable plastic with a frosted white plastic lens to resist breaking and the fading from the sun. They can be installed in the ground with a stake or attached to the top of post on a deck. The height of each fixture is 9 inches without the ground stake. I have written an article on how to layout you wire and some things to look for here. See that article first if you have not done any low voltage lighting before. If you uncomfortable to install yourself, you may want to consult a local qualified electrician. When you open the box, you will want to sort things out for the assembly of the light fixtures. Take your time and be patient, some people have stated in the comments that these fixtures are impossible to assemble. Take your time and follow instructions. If it were me I would leave the top cap off until I tested the lights with the power on, sometimes the bulb or the connection will need a little fiddling. The first step in the setup is to layout your wire run. If you followed my steps as explained above, you should be ready to layout the fixtures and hook up the connectors to the wire run. If a fixture does not work, look at three things, Photo cell is getting too much light, wire connectors or the light bulb. Your connectors may not be aligned with the wire or installed properly, make sure pins are going into the wires. The photo cell must have some darkness to work properly, do not install under another light fixture. Light bulb wires are not aligned with the connections in the fixture. 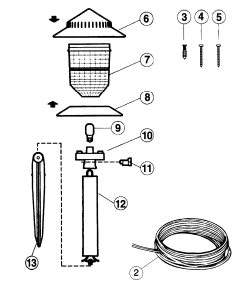 Some replacement parts are available at the vendor, use the current link in the instructions. If you have the time and a little mechanical skills, you can add a low voltage landscape lights kit to any pathway that will light up your path to your front door for your guest. This will be the first invitation to your home, make it count. I do have some Low Voltage Landscape Light Fixtures on the path to my front door. Very little upkeep after installation. It does take some skills to assemble and install this kit, once installed it will be easy to upkeep, just stand them back up if they get knocked over by the kids. If you have any questions, comments or something to add to this review please use the form below. Hi! Thanks for this review. I was wondering if these are solar powered and if not can you estimate about how much they cost to operate on a monthly basis? I was also wondering if the stakes are included. I don’t have any posts to put them on and would have to install them at ground level along my footpath. One other quick question. Do I need to use all 10? My foot path from the driveway to the front door is rather short and I may not need all ten. Sorry for all the questions! Thank you! Questions not problem. You can reduce the cost of operation and get a little better light cover by using LED bulbs. The cost of these bulbs are high, the savings will take a little time to get your investment back in reduced cost. These fixtures do come with ground stakes, you can use or change your mounting system to fit your outdoor design. You do not have to use all of the fixtures, I only use 8 out of the set of 10 that I have. You cannot have any more fixtures on this transformer as it will overheat and fail to work in short order. This is a very informative and helpful article. I have always thought outdoor lighting looked so nice and increased security, but never had faith that I could actually install a lighting system successfully. I appreciate the link to directions on layout of the wire. Your directions are easy to follow. I also appreciate your truthfullness about other statements on difficulty of assembly of fixtures. I live in the interior of Alaska where winter temps can dip into the -60s Fahrenheit. Is there outdoor lighting that can hold up to these extreme temps? Which ones do you recommend? These fixtures will work in these temps. The biggest problem you will face is the snow level covering the fixture and you get a snow glow on your walkway. If you have trouble with bulbs lasting, I would convert to replacement LED bulbs.